Tadao Ando, a self-taught Japanese architect was born in Minato-ku, Osaka in 1941. After being a boxer for a short period, Ando began his self-education by apprenticing with several professional designers and city planners. He attended night classes to learn drawing and took correspondence courses in interior design. At the age of 18 he visited temples, shrines, and tea houses in Kyoto and Nara, observing the traditional architecture in the area. In the 1960s he travelled to Europe and the United States to analyze great buildings and document his observations in a detailed sketch book. He visited buildings designed by renowned architects like Le Corbusier, Ludwig Mies Van der Rohe, Frank Lloyd Wright, and Louis Kahn. He returned to Osaka in 1968 to establish his own design studio. Today he is known as one of the famous architects. He has been awarded numerous times. Some of his awards include: Alvar Aalto Medal in 1985; Pritzker Prize in1995; RIBA Royal Gold Medal in 1997; AIA Gold Medal, 2002 and Neutra Medal for Professional Excellence in 2012. Built in 1976, Row House which is made of exposed concrete replaced the middle unit of three row houses in a downtown district of Osaka. 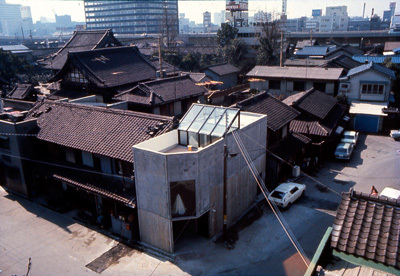 Ando, who sees himself as a “fighter-architect”, designed a concrete box amidst the dilapidated wooden row houses that crowded the central areas of Osaka and created a highly self-sufficient living space. Koshino House, a holiday home that Ando built for fashion designer Junko Koshino near Osaka in 1980. The house is made up of two parallel constructions that are partly set into the steep slope on which they are situated. An underground corridor connects the two buildings. The courtyard in the middle brings the various elements together and helps with the illumination of the house. A design studio extension consisting of fractured circular segments was added as a third element in 1984, stretching back up the hillside. Time’s 1 began in 1984 and Time’s II in 1991. They are located in Kyoto, Japan. Tadao Ando was hired by the owner to remodel his building. Times 1 building is half-submerged in the level of the street, which is almost at the same level with the river. The building is a small 3-story block, topped with a metal dome. The corridors along the side facing the river collect the pedestrian flow of the street. Access to the Time’s II is made through a small corridor at the back of the neighboring plot, which is located in the opposite corner. Both buildings are interconnected through corridors and bridges. The housing complex at Rokko, is located outside Kobe in Japan. The designs for Rokko Housing One were completed in (1983) and for Rokko Housing Two (1993) respectively. The structures survived after the Great Hanshin Earthquake of 1995. Japanese Pavilion for Expo 92 was built in Seville Spain in 1992. This was Tadao’s first project outside of Japan and the first structure to be built on a material other than reinforced concrete. When visitors enter the building, they will first notice a bridge-shaped arch which leads to the second floor connecting east and west. The rooms vary in size and height. The entire structure is built entirely of wood and covered with Teflon. This seminar house on the site of Vitra in Weil am Rhein Germany was built in 1993. It was built around a yard of cherry trees as Tadao Ando was reluctant to destroy them. This house has a very calming atmosphere. The United Nations Educational Scientific and Cultural Organization was founded at the end of the World War II, with the aim of promoting peace, scientific co-operation and cultural exchange. In 1995 UNESCO celebrated its 50th anniversary. To commemorate its milestone anniversary a space was created for meditation at the organization’s headquarters in Paris. It is deemed a place to contemplate a world without conflict and with lasting peace, regardless of individual differences and beliefs. It was financed through Japanese private donations. Modern Art Museum of Fort Worth is located in Fort Worth, Texas, USA. It was built in 2002. The museum was constructed with only concrete, steel, aluminum, glass and granite and is reflected in the surrounding pond. Light plays a key role in the design emphasizing both diffused and reflected natural light.